Writing a narrative short story isn’t easy. 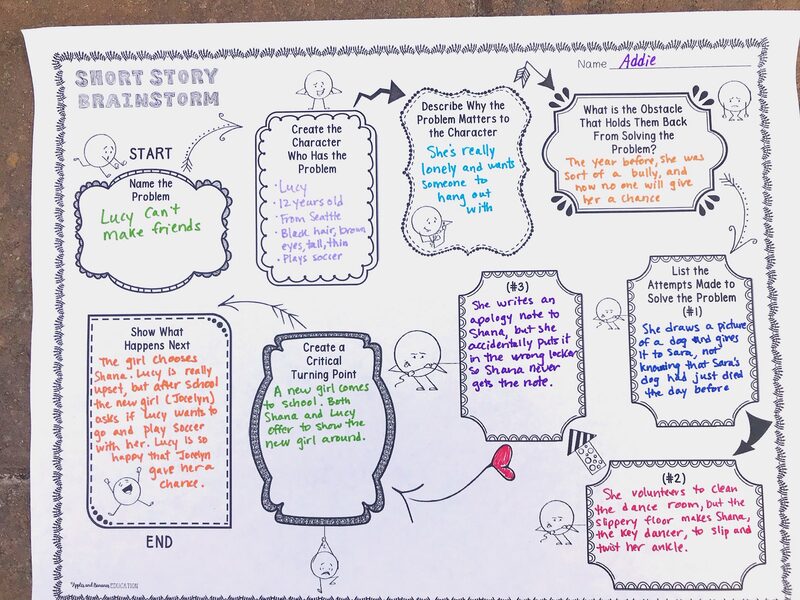 Many kids enjoy creative writing, but their structure ends up being all over the place, they don’t know how to create a problem, build suspense, develop an ending, etc. 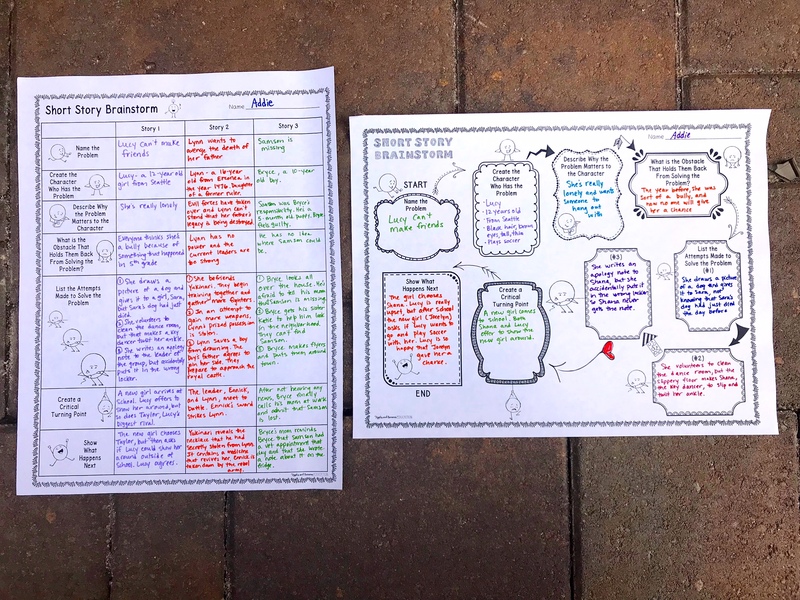 I wanted to create something that would allow my upper elementary/middle school (5th/6th/7th graders) to plan more than just the beginning, middle, and end of their stories. In order for students to write short stories, they need experience reading short stories. There are gobs of websites and blogs that go into great detail about this step, so I won’t spend too much time on it here. In the past I’ve used stories such as “Contents of the Dead Man’s Pockets” and “Scout’s Honor,” but find some that work for you. 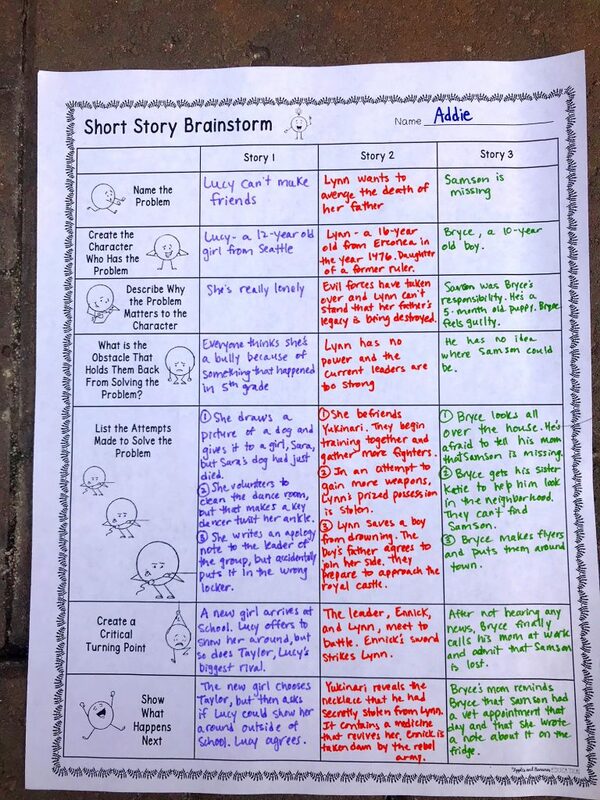 Because I don’t work in a traditional classroom setting (or with any sort of curriculum), I find myself piecing together bits and pieces of lessons from other people, including this gem that I found from mythcreants.com about how to outline a short story in seven steps. What I really loved is how this post took three different possible storylines and then followed all three through each step of the short story writing process until the end. For example, a seemingly mundane story problem (The garden isn’t pollinated), gains traction and makes the reader care about the problem (the garden produces a plant that provides a life-saving medicine – if it doesn’t get pollinated, people close to the child will die!). **Note – you will want to preview the entire blog post and modify as necessary for your group since the original post was intended for an adult writer. I passed out the first graphic organizer and encouraged my students to spend time thinking of three possible stories. Really encourage your students to STRETCH themselves at this point. They are not committing to any one story, they are just getting their juices flowing. Students will spend time in class working on the chart. Allow as much time as necessary so that students have three possible stories to work with. My students were given lots of choice here, as long as it was a narrative story. Some chose fantasy, some went with realistic fiction – it really doesn’t matter which genre of narrative writing they choose. The more buy-in they have, the better the final products. Gather students together in small groups or partners and have them read their three storylines out loud. I had my students do an informal discussion where they asked questions and gave suggestions. The process is really to just help the students make sure that their storylines make sense. Some students may say that they don’t want to say their endings out loud – DON’T LET THEM GET AWAY WITHOUT REVEALING THEIR ENDINGS! I made this mistake, and when my students wrote their rough drafts, all of them could have used additional supports with their very last scene. I would tell students that they need to reveal the ending in order to get feedback from their peers. Besides, their peers will be closely involved with their stories through the peer editing process. Have your students decide on which story they want to write. They will fill in the following graphic organizer, which is what they will use to write their rough drafts. They may make some modifications from their original story idea. That is perfectly fine! Having your students spend a lot of time on the pre-writing process of writing a short story will definitely pay off when they go to write their actual short story. Too often students are told to “write a story” without knowing that they can plan and outline a story just like they would plan a different type of writing. Please visit this link to get a free download of the graphic organizers mentioned in this post!